Dovo is a German manufacturer of straight razors that is located in Solingen, Germany. According to their website, the company was initially founded in 1906 by two founders Mr. Dorp and Mr. Voos and employed 13 staff at the beginning. Over the years Dovo expanded into different product lines such as scissors, manicure and pedicure tools, and hair dressing tools among other things. Also, throughout the years Dovo has taken over various brand names and companies with their most recent purchase being Merkur, a manufacturer of safety razors, which Dovo acquired in 1996. 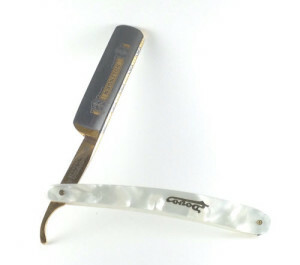 Dovo is perhaps the most prevalent brand of straight razor in the world today. Most e-commerce websites that sell traditional shaving equipment will carry Dovo straight razors and Dovo shavettes. Dovo straight razors are regarded as being of high-quality and made from quality steel with a minimum carbon content of 0.6%. Their straight razors come in a variety of blade grinds and blade widths. The blades come in either a flat ground, full hollow ground or 1/4 hollow grind and the come in widths of 3/8″, 4/8″, 5/8″, 6/8″ and 7/8″. The handles to their straight razors are made out of either celluloid, wood, or some sort of bone. Recently they made a razor with a handle made out of mammoth ivory.